Welcome to our ultimate guide of quartz countertops including the pros and cons, pictures, kitchen design ideas and much more. Quartz countertops are often confused with the natural stone quartz. 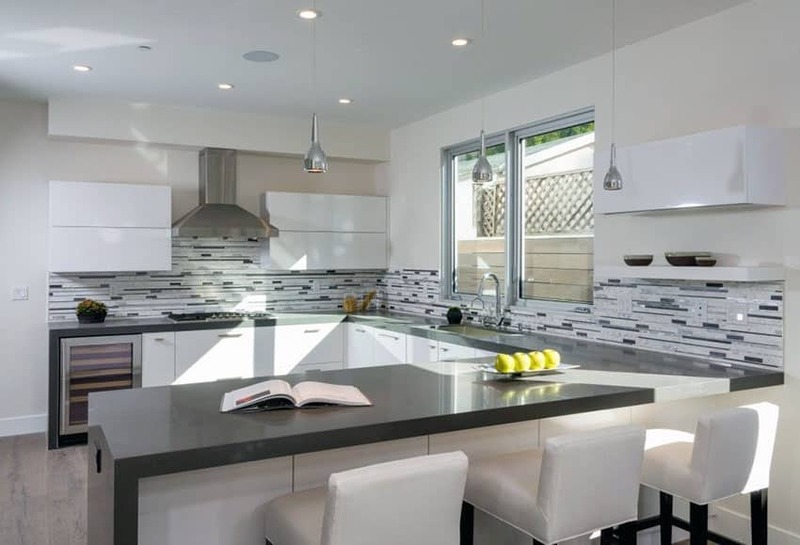 The common misconception about quartz countertops is that they are 100% made of pure natural quartz, but in reality, quartz countertops are man made and are composed of other materials as well. Pure quartz , also known as Rock Crystal, is a type of colorless hard mineral that is quarried from the earth in the form of slabs. While quartz that is often referred to when speaking of countertops, is a type of engineered stone. It is made up of more than 90% natural materials which is 93% crush quartz powder and 7% binders which are either polymeric based or cement based, plus a type of epoxy resin. The addition of binders and resins holds the crushed particles together and reinforces the strength of the material. Thus, quartz is also known as engineered stone or compound stone because of its material composition. Quartz is very hard and has a granite like surface, Man made pigments are then added to this mixture to give the engineered stone different colors. Quartz is also manufactured to look like natural stone. It closely resembles granite, marble and limestone, but gives the benefit of a harder and more durable finishing material. Because quartz countertops are engineered, it can be produced in any color through the use of pigments. It comes in different colors, from neutrals like white, beige, browns, grays and blacks to subtle hues of blue, green, pink or darker shades of red, gold or charcoal. The surface of quartz also have veining and speckling similar to marble and granite. Its appearance is also dependent on how quartz is ground. Finely ground quartz produces an engineered stone with a very smooth surface, while coarsely ground quartz produces a flecked appearance. In addition to tht, other types of materials like glass and stone can be incorporated in the material make up of quartz to give it a more unique look. Pure quartz is the most abundant mineral in earth, while also being one of the hardest. More than 50 years ago, manufactures saw its great potential to be used as a surface material for interior applications. 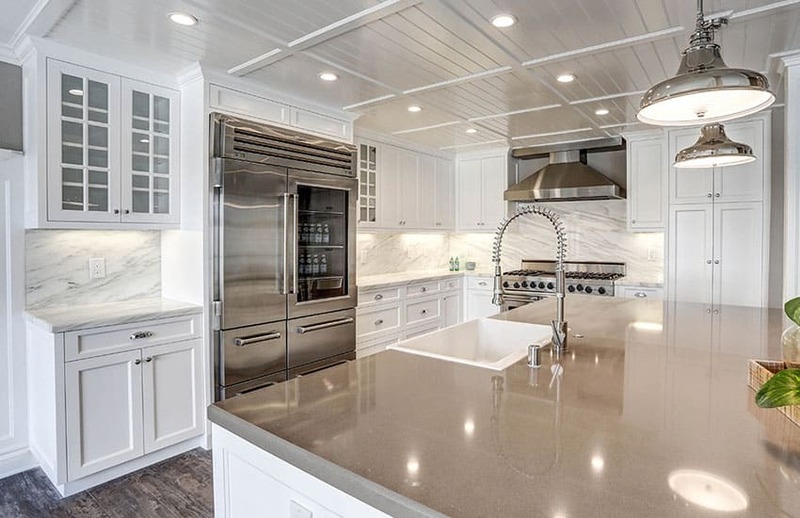 Combining the natural inherent properties of pure quartz mineral along with some artificial materials led to the production of one of the most durable countertop surfaces available in the market. It is the only man made material that is at par with the durability and strength of natural stone countertops. Marcello Toncelli invented the very first quartz which was hand poured into mini slabs of 12 inches by 29 inches.There are different brands of quartz in the market but the patent for this material is owned by the Italian company, Breton who started manufacturing the product in the early 1960’s. Breton invented the process of engineering quartz by pressing natural stone powder and polymer resins together. Up to this date, Breton continues to by the leading supplier of quartz and compound stone making equipment in the market. Quartz countertops quickly gained its popularity in European kitchens and then spread into the United States. Silestone and Caesarstone are the most well known brands for quartz countertops. Other popular brands of quartz countertops are Cambria, DuPont, Zodiaq, Celador, LG Viatera, Avanza and Technistone. These companies try to manufacture their own specific line of quartz colors and pattern to differentiate their brand from others. Aesthetics – Quartz has a beauty that resembles natural stone. Its three dimensional appearance and natural luster makes it appealing for most homeowners. High durability – As mentioned earlier, pure quartz is inherently hard and combining it with resin binders reinforces it strength and durability making it one of the most trustable countertop surfaces in the market. Performance wise, quartz countertops are at par with concrete and granite. It is more forgiving compared to natural stone and won’t crack or chip easily. It makes a good work surface. Scratch resistant – Quartz countertops resists surface damages like dents, cracks and chips. It can be used as a cutting surface as it won’t be affected by knife marks. Abrasive pads are also not harmful for quartz countertops. Heat resistant – Quartz is heat resistant, but only for a short period of time. It won’t get easily damaged when it gets in sudden contact with hot pans or pots and hot serving dishes are also not harmful to its surface. However, this is only up to a point. Exposing it too long to high temperatures can cause potential damage. Stain resistant – Quartz is nonporous thus it resists staining much better than natural stones like granite or marble. It stand up to spilled liquids like water, juice, oil, wine, coffee and even alcoholic beverages. Antimicrobial– Quartz countertops limits bacterial growth because there is no chance for water to build up, penetrate and seep into the material’s body and surface. In addition to that, quartz countertops do not require grout for installation and we all know that grout lines and seams are the most vulnerable parts of countertops because it allows dirt and grime to get stuck within the gaps. Consequently, odor causing molds and mildews are prevented and viruses or bacteria are not harbored. Low maintenance – Daily upkeep for quartz countertops requires minimal effort. All you need is piece of damp cloth and a mild soap and water solution. Gentle scrubbing is all you need to remove stains. No need for resealing – Natural stone needs to be sealed before use and undergo period treatment to ensure that is properly protected from liquid spills and water that might seep into its surface. 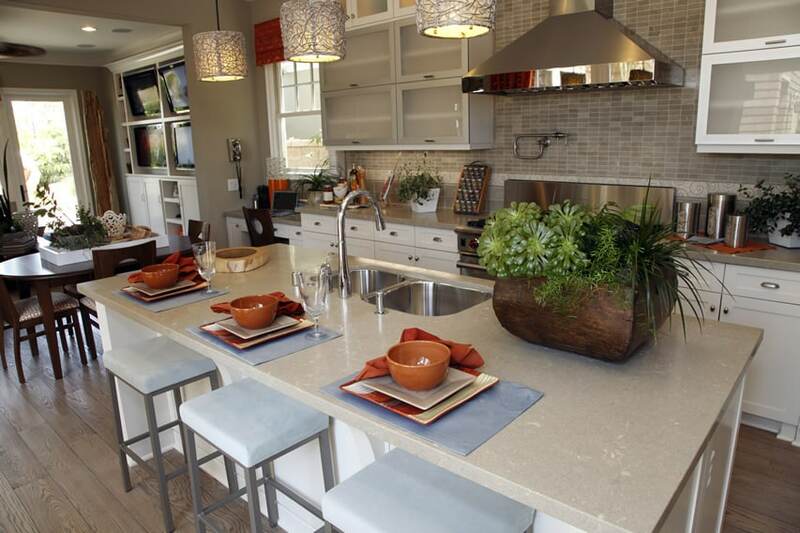 With quartz countertops, there is no need for such as it is impervious to water and moisture. Consequently, this tantamounts to significant savings in terms of maintenance too. 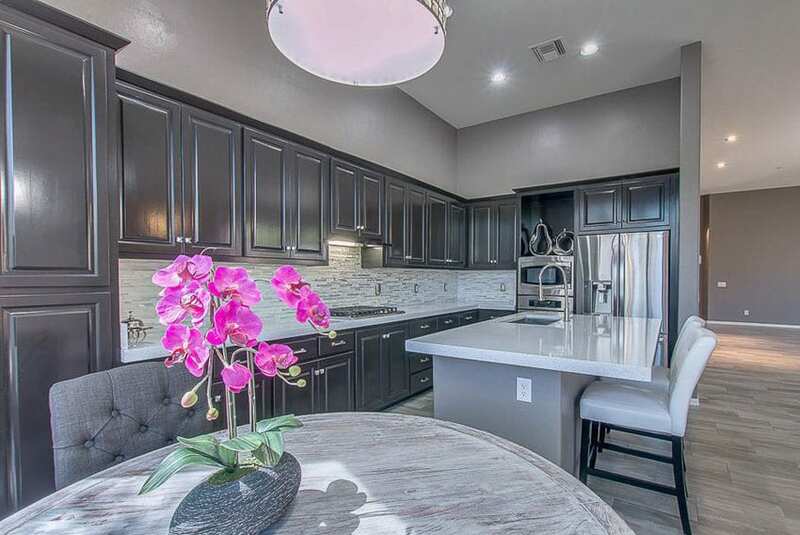 Uniform appearance – Unlike natural stone which usually has an inconsistent color because it is quarried in slabs, quartz countertops have a consistent and uniform color all throughout. Granite, for example, needs to be bought from the same batch to ensure that the color is book matched, but for engineered stone, there is an even color and a smooth transition. This material is perfect to use for waterfall island counters and it is also the best countertop option for homeowners who are very particular when it comes to blemishes and natural imperfections. Texture for quartz countertops is also consistent. The manufacturing process for quartz is controlled that is why it is nearly perfect. Long lasting – Provided that quartz countertops are properly cared for and well maintained, it can last for decades. Quartz suppliers and manufacturers typically include a 10 to 15 year warranty for countertops, while some even include a lifetime warranty. Versatility – Quartz countertops generally have a contemporary look but it offers versatility when it comes to mixing and matching for a well balanced kitchen design. It can be used in a variety of design applications and can match almost any design style, whether it may be traditional, transitional, contemporary or modern. It is available in a wide array of colors and offers diversity when it comes to patterns. Flexibility and high customizability – Quartz is one of the most design friendly countertop material options in the market. Since quartz is man made, it is highly customizable and can be used to produce any shape, size or form.Fabricators can bend or curve the material easily, thus edgings, curved countertops or sinkholes are not problematic areas compared with natural stone countertops. It can even be cut into standard tile sizes for easier installation and can be used for both floor and wall application. Can be installed in one piece – Some manufacturers offer continuous runs of the countertops with little to no visible seams. This remains true even for the standard size quartz slabs which typically have a size of 60 by 120 inches. There are no visible seams as the addition of resins allow for cleaner cuts. 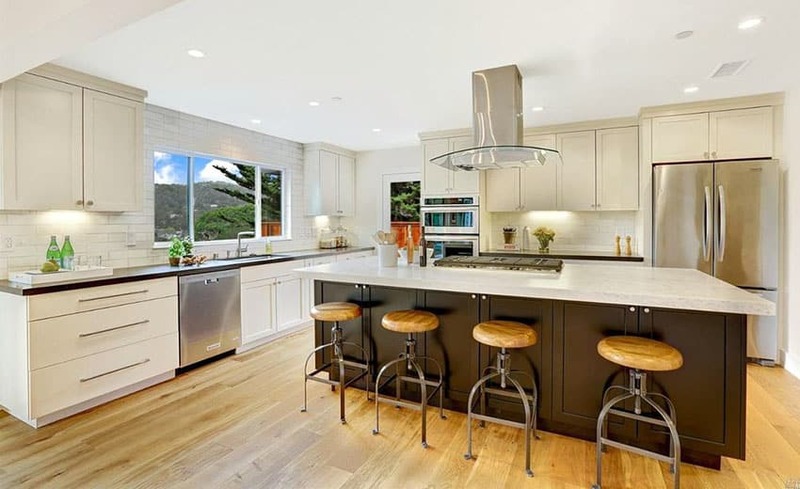 Can get quite expensive – Compared to other countertops materials like concrete, wood, laminate, quartz is more expensive.While compared to natural stone options, the price point of quartz countertops is almost close to granite . DIY countertop materials usually run below or about $10 per square foot , but quartz is generally more expensive and can amount to $80 to $140 per square foot including the installation. Quartz countertops are not suitable for outdoor use – Quartz is only meant for indoor use. Some manufacturers void the warranty if it is installed outdoors or in an uncovered area. 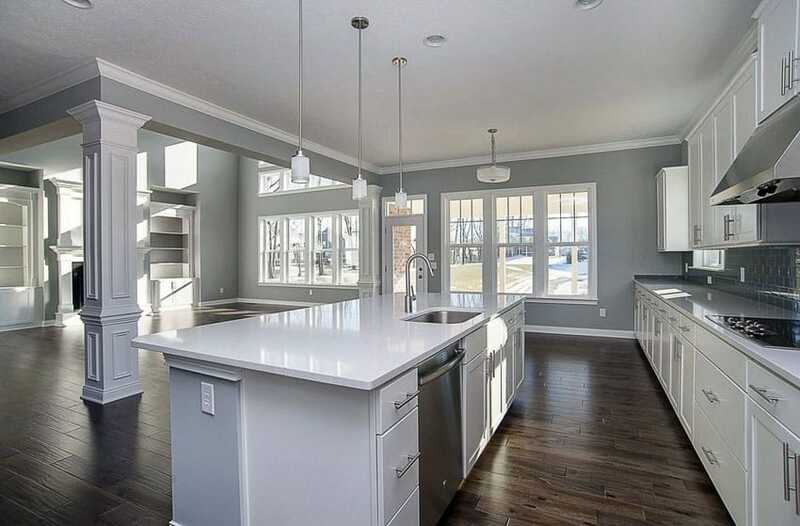 Exposure to direct sunlight can cause potential damage to quartz countertops – Quartz is sensitive to UV rays, resulting to changes in color once regularly exposed to the heat of the sun. In addition to that, excessive heat and sun can cause quartz countertops to split and warp over time. Quartz countertops cannot take extreme heat – Quartz countertops are heat resistant but it has a limitation. This is due to a plastic resin that is used in manufacturing quartz. According to some manufacturers, quartz countertops can handle up to 300 degrees Fahrenheit of temperature. ALthough it won’t get easily harmed by hot pans, leaving it too long above the counter can eventually result to surface cracks. Just to be sure, make use of a hot pad or trivet for pots and pans to protect your quartz countertops. The price of quartz can go anywhere from $50 to $100 per square foot for the material alone, depending on the brand, color and design. On the average, the material cost of quartz countertops us about $75 per square foot, excluding the installation. The cost of low quality quartz can run from $50 to $60 per square foot. Mid quality quartz is usually priced $60 to $70 per square foot, while high end quality quartz is typically $70 to $100 per square foot. The installation cost of quartz countertops can run anywhere from $150 to $180 per square foot, depending on the finish, number of slabs and the edging design. For a countertop that measures 25 square foot, the price for the material and installation can cost a homeowner between $1200 to $2700 for the whole project. Aside from the quartz surface material and the cost of installation, some additional factors which are included to the total cost of the project are : the edging design and fabrication, the leveling of the material, seam jointing and cutouts for the fixtures and sink. The support for the countertop material is usually not included, so you have to check your existing kitchen conditions in order to meet the supplier’s requirements. The edging treatment, on the other hand, is usually included to the material cost, as long as the design is basic and standard. Specialty edge profiles usually incur extra costs. Granite is the most popular natural stone material and remains to be well loved by most homeowners because of its beauty and durability. Quartz, on the other hand, is almost similar to granite when it comes to performance and aesthetics, but they differ when it comes to their material composition as quartz is man made. Quartz is a little more expensive than granite. The price of quartz can range $80 to $140 per square foot including the installation. Granite costs $30 to $150 per square foot, but high end granite costs more and can amount to $175 per square foot. Thus, the average price for installed granite is $60 per square foot, compared to installed quartz which can amount to $75. What Factors affect the cost of quartz countertops? Grade of quartz – Quartz come in a variety of colors, design and style. Although each brand has a specific classification for their quartz countertops, it can be generally categorized as standard, premium or designer. Standard grade quartz is usually plain and comes in a solid color. Premium and designer quartz are specialty designs which have richer patterns and color. Some suppliers also offer quartz at a low price if their design is discontinued. 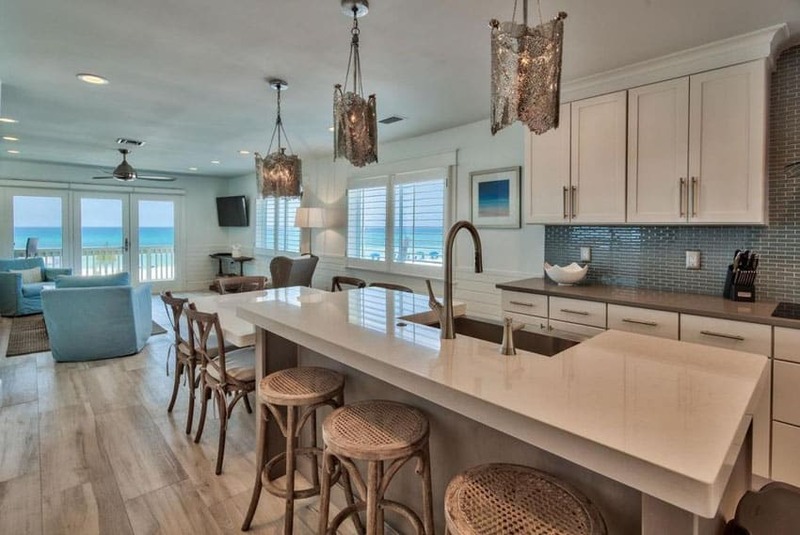 The nature of the project – The nature of the project also affects the cost of quartz countertops because it determines the complexity of the fabrication of the quartz countertops. Simple kitchen layouts which fall under standard quartz slab sizes will typically need a single slab of quartz with no seams, thus it is easier to install. Quartz countertops with more cuts are more laborious to install. Countertops with multiple seams, cutouts for the fixtures and a specialty edges are also more expensive. Brand and source of the material – Quartz countertops have different brands and manufacturers. While the quality that they offer is the same, the prices that they have differ. Some brands are also considered to be more high end than the others. Installation – DIY or hire a professional? The type of installation that you need for kitchen countertop is dependent on the nature of the project. Simple kitchen countertops which use single quartz slabs can be undertaken as a DIY project using prefabricated quartz countertops, thus saving costs in terms of labor. However DIY installation is only recommended if you are skilled and experienced. Professional installation will usually take about 30% to 50% of the total project cost, depending on other factors. 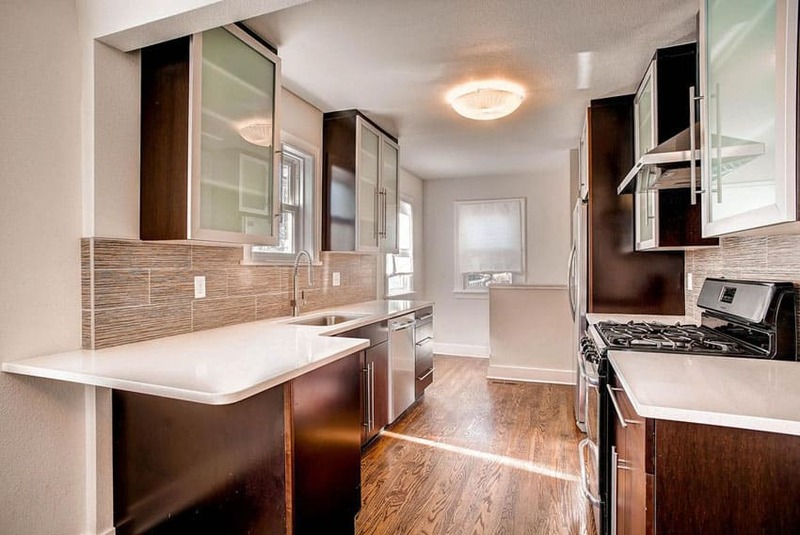 Where to buy quartz countertops? Quartz is usually available in most local home improvement stores and kitchen design showrooms or specialty stone suppliers. Ideally, look for a store which manufacturers the material, handles the cutting, edging, fabrication, finishing, design and installation. Buying your quartz countertops from trusted suppliers will ensure that you get the best quality of material and that the installation is handled carefully by skilled professionals. Quartz countertop suppliers usually offer their clients a small sample of the material so you can get an idea of the actual color and pattern of the quartz. You can also use the material sample to see if your quartz countertop matches the color of your existing cabinets. However, it is is best to see the actual slab of quartz before purchasing. One of the primary benefits that quartz countertops can offer is the wide diversity of colors, patterns and finishes that it can offer. Quartz, being a type of engineered tone, comes is a wide array of colors which are produced by adding pigments to the resin and powdered quartz mixture. Most of quartz colors come from the inherent color of quartz but through the addition of colorants and pigments, the tones and shades can be adjusted. The opportunity to customize more colors allows manufacturers to develop their own distinct line of quartz countertops. And this range is continuously developing as the brands strive to offer newer and fresher options for today’s homeowners. Another notable attribute of quartz’s colors is that they are more consistent compared to natural stone. Natural stone like granite is quarried in slabs and each of the slabs is different. Each batch has a unique color, thus matching can sometimes be quite difficult as the surfaces can show little differences in color. The uniformity and consistency of quartz’s colors also allows homeowners and designers to try on different design applications. Quartz come in a broad spectrum of colors, but this colors have different names depending on the supplier. Colors for quartz countertops are leaned towards natural shades and earth tones like grays, browns, tans and greens. Neutrals like bright whites, creamy beiges and black are also some of the popular options. It is also available in subtle hues and pastels like blue or rose, to rich darker shades like red, green, gold or copper. Other brands also offer bright and bold colors which complement contemporary kitchen settings. 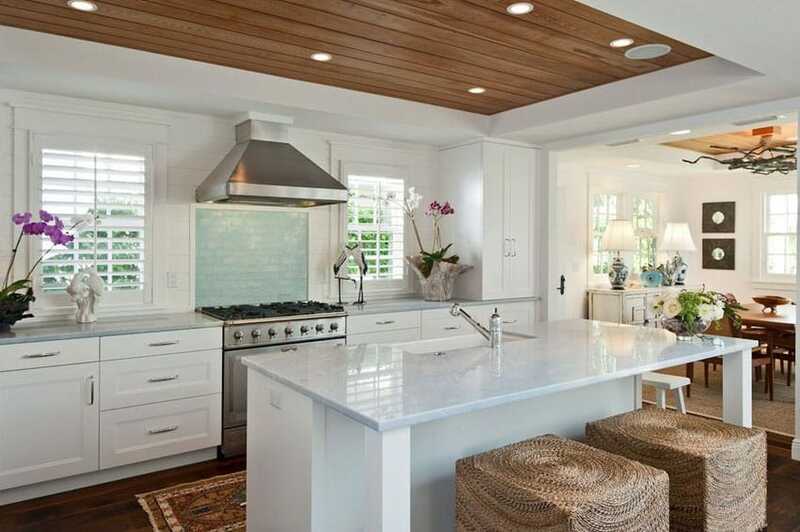 White is one of the most well loved countertop colors. Just like any other natural stone material, white quartz countertops are very versatile and flexible when it comes to design applications. 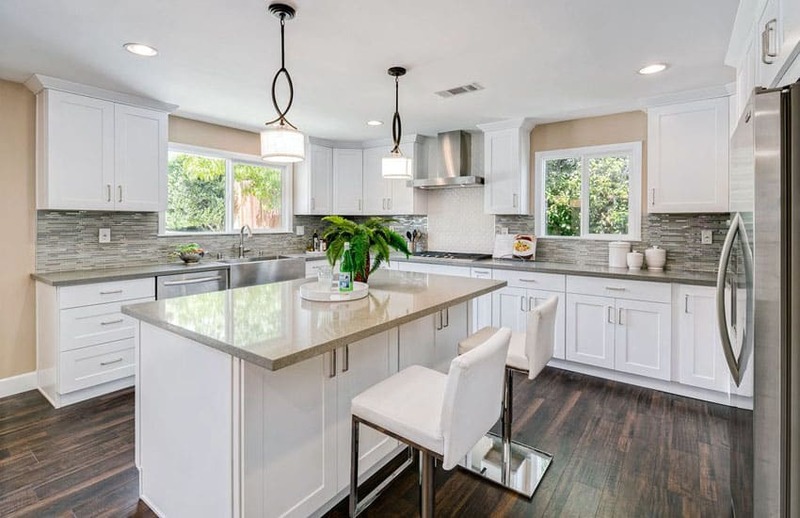 Being considered as a fail proof color, white quartz countertops go well with all design styles, whether it may be traditional, classic, transitional, contemporary or modern. Unlike with natural stone options wherein pure white materials are hard to come by, quartz countertops are available in a plain, solid white color. White quartz is also available in different tones which range from the brightest ultra white to creamy off white tones. The patterns for white quartz is also diverse, some contain soft to dramatic veining patterns, while other variants have fine flecks or metallic specks of minerals. This variation in pattern and texture allows homeowners to create a more interesting “all white” palette for their kitchens. 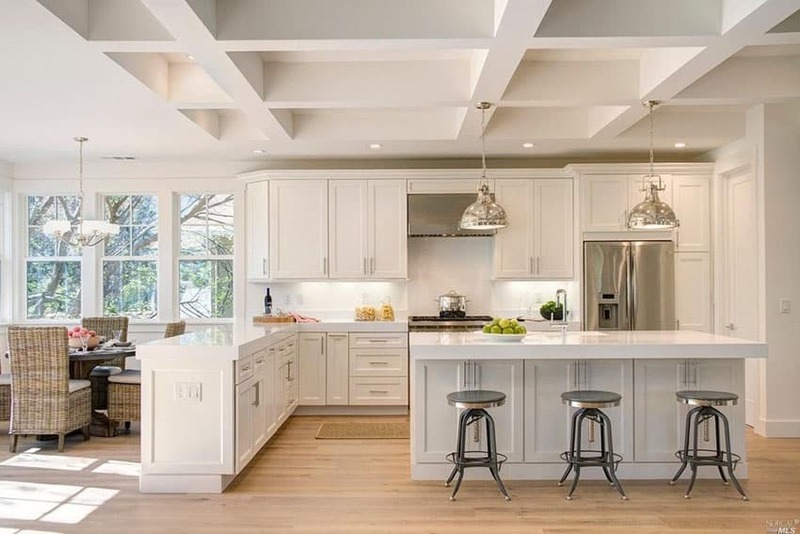 When used as kitchen countertops, white quartz gives off a luminous and bright appearance which makes spaces appear more airy, clean and spacious. It is a classic choice that adds elegance and sophistication to luxurious kitchen settings. 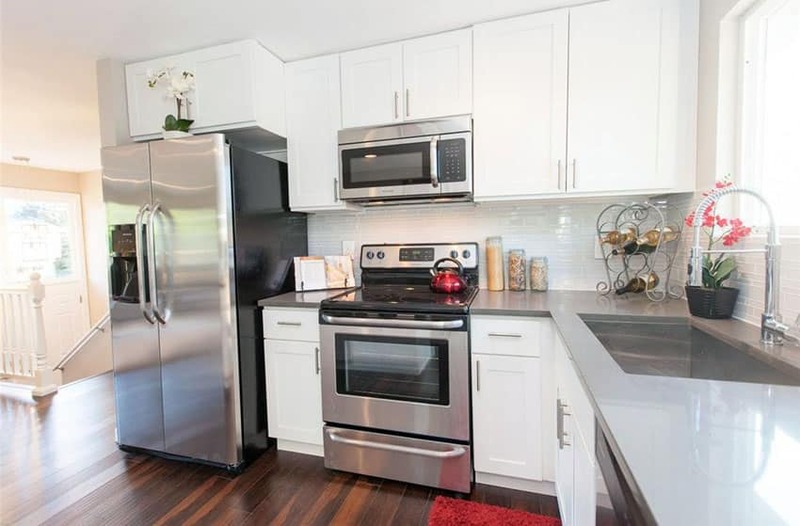 When using white quartz countertops with white cabinets, make sure to choose something which has veining or flecks so as to to break the monotony of the space. However, you can still go with a solid white quartz countertop if you are aiming for that flawless, streamlined, minimalist look. White quartz countertops and other light colored quartz are also recommended for use in small kitchens as they tend to create an illusion of space and a more open environment. 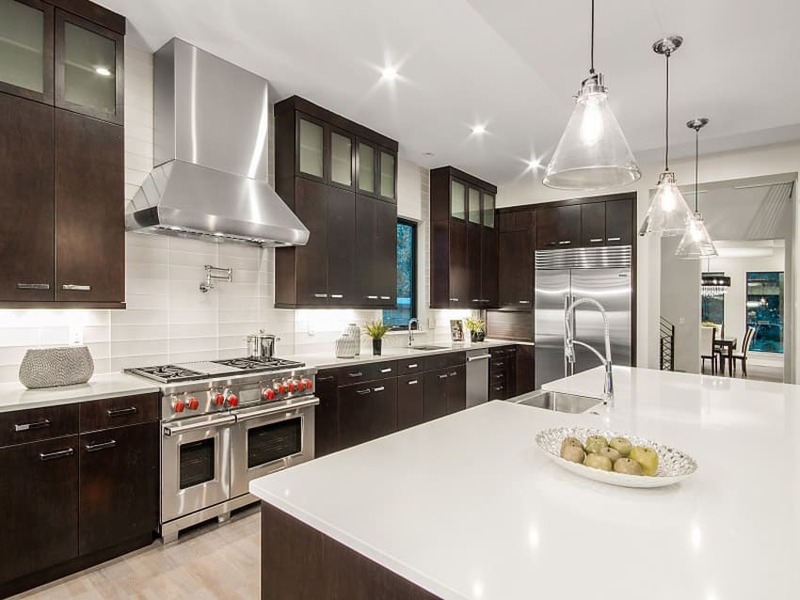 White quartz countertops also look extra striking when paired with dark colored cabinetry. Alternatively, it can be used with other cabinetry colors to achieve a stark contrast. 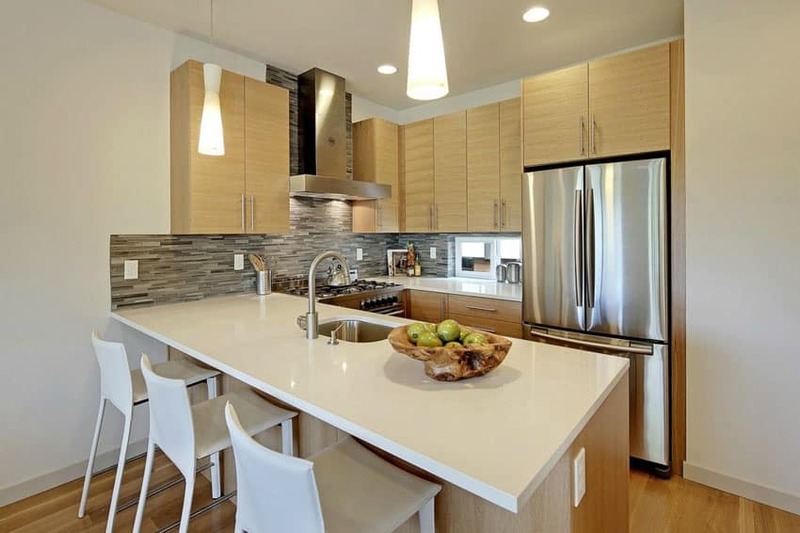 For more white quartz countertops pictures and ideas check out our gallery page. Beige quartz countertops are the perfect alternative to white quartz countertops. 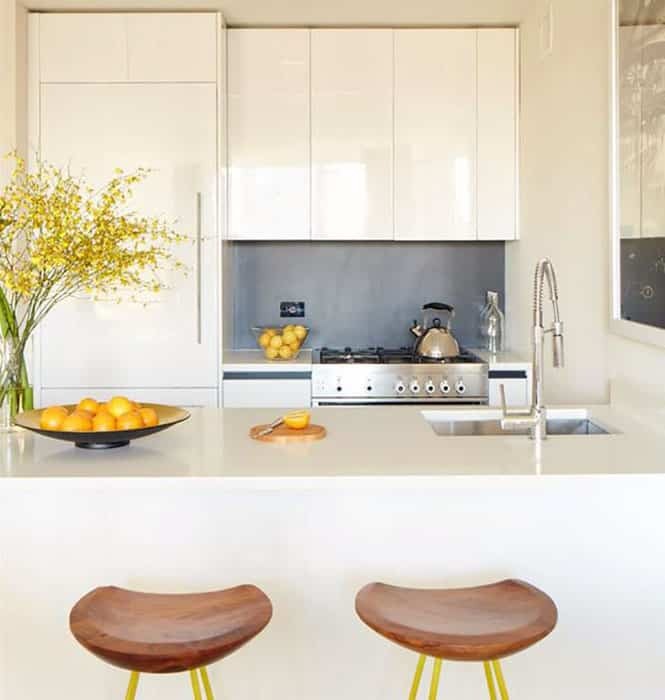 If you find white quartz too plain or dull, you can go with beige as it has a yellow tinge which produces the perfect balance of cool and warm undertones. Beige quartz is also versatile when it comes to design application as it is also a neutral color. Although it can be used for both traditional and modern designs, beige quartz countertops are more suited for classic inspired settings. Try pairing beige quartz countertops with wooden cabinetry or distressed cabinets for that traditional elegance and flair. Black quartz render a dramatic appearance and give an added depth and dimension to a space. 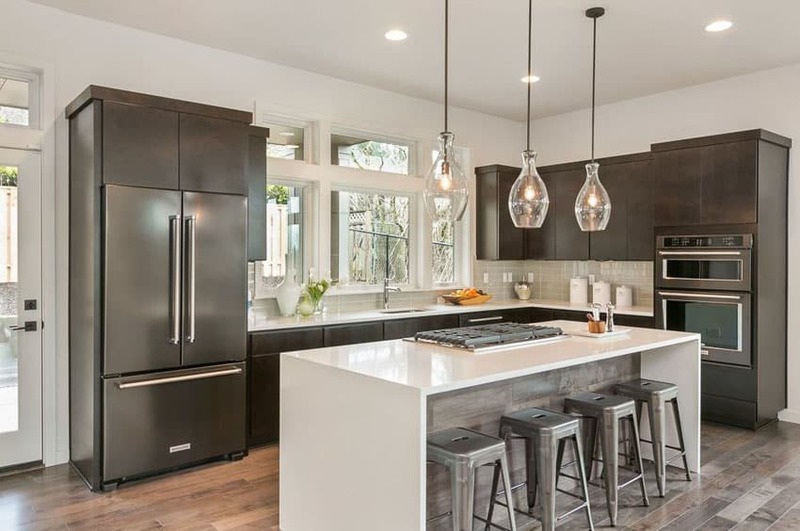 Compared to light colors, black quartz is more noticeable in a space and creates a bold statement. One advantage of using black quartz countertops is that it tends to hide dirt well compared to light colored countertops. 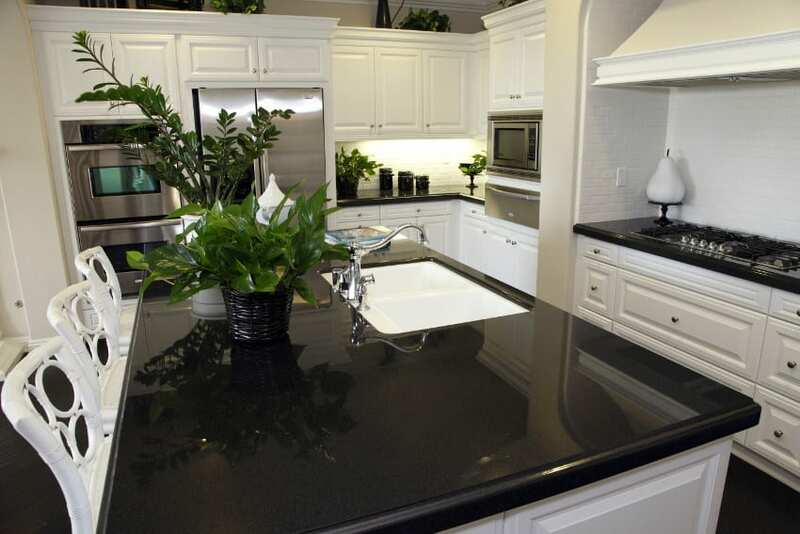 Black quartz countertops are more suited for contemporary kitchens that feature white cabinetry. This classic pairing is one of the timeless cabinetry and countertop color combinations which proves to never go out of style. 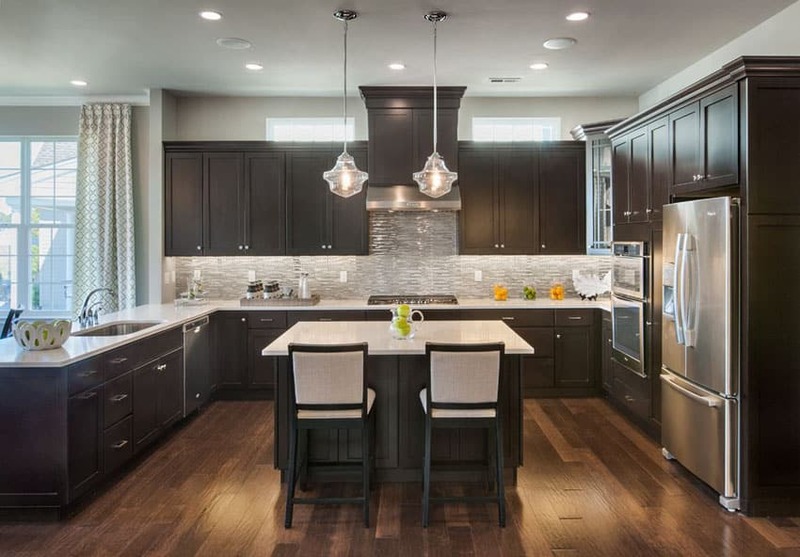 Also, the beauty of black quartz countertops is that most brands offer a design which has a unique shimmering effect caused by luminous flecks that look extra stunning under lighting. Back quartz countertops also look super elegant and stylish when used for kitchens. Considered as the new neutral for the modern kitchen design scene, gray countertops, whether quartz or natural stone are well loved because of the quiet strength that they lend to spaces. With the right shade, gray creates a dramatic effect that isn’t overwhelming. Gray quartz countertops are very versatile as it can be paired with both light and dark colored cabinetry. 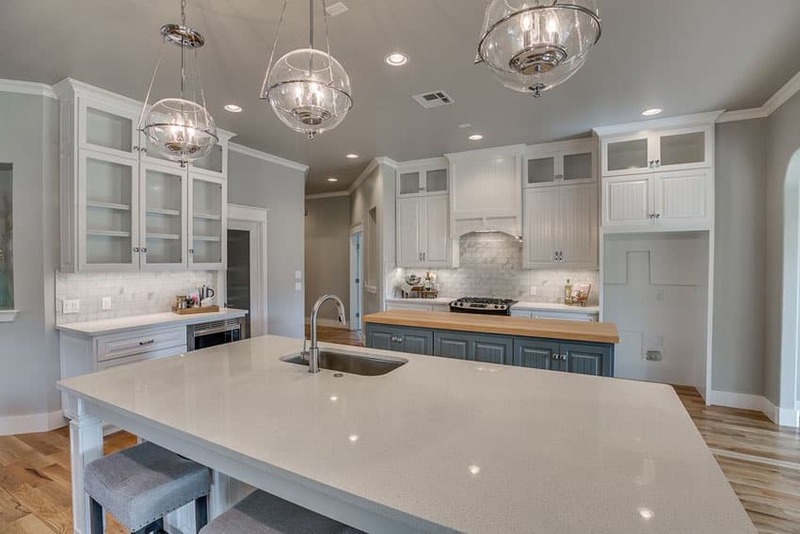 If you do not like the softness of beige and the brightness of white, gray quartz countertops can be a perfect substitute in creating contrast with dark cabinetry, while if you are looking for the perfect quartz countertop to complement light wood, cool gray quartz countertops are also one of the options you can explore. Gray quartz countertops can also be used to enhance the color of natural solid wood cabinetry by highlighting its undertones. Earth colored quartz include a number of different shades which range for, tans, browns, sand to gold, yellow and honey. Brown and gold quartz countertops project warmth which makes kitchens more inviting, homelike and welcoming. Brown quartz also is also more natural looking, and also lends coziness to a kitchen especially when paired with wooden cabinetry. 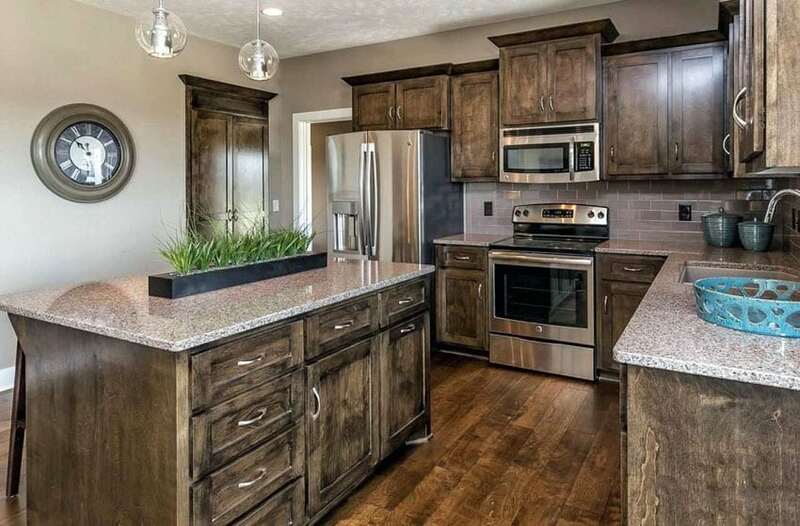 Brown and gold quartz are your best bet if you want to create a monochromatic color scheme for your kitchen. Using the same shade of cabinetry and countertop produces a design that is tied together cohesively. Brown quartz complements the inherent color of wood, while gold quartz help enhance its undertones. Brown and gold quartz are the perfect countertop colors for classic kitchen schemes. 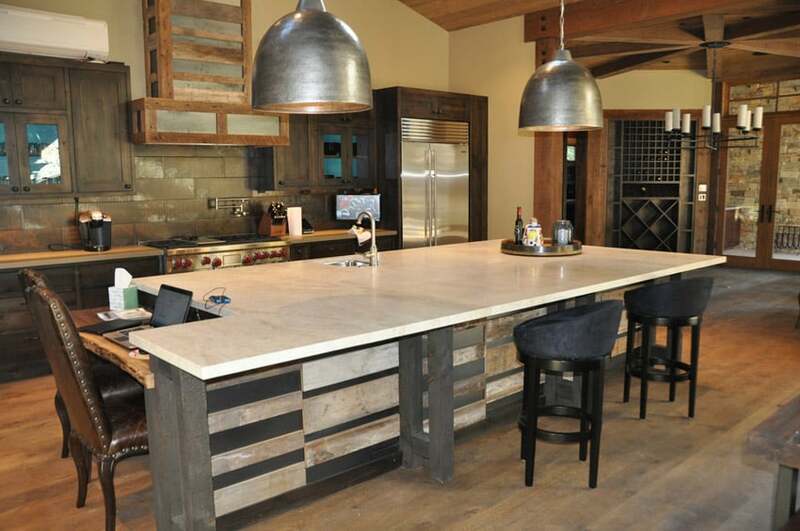 It complements the rustic style, country inspired and contemporary kitchens. Red, blue and green quartz countertops are less common in kitchens, but these unique colors can instantly transform your kitchen into a striking statement. These colors tend to make kitchen spaces more lively and offer an interesting pop of color to a space. Typically, these unique quartz countertop colors are used for modern settings, while the ultra deep and dark versions are sometimes used for rich traditional kitchens. Ideally, exotic colored quartz should be paired with light colored cabinets so that they do not compete with other in a space. Blue Agate – has a very unique looking pattern which looks like a mosaic, a premium type of quartz with ocean blues, turquoise, pearl and sapphire. Aside from the wide array of colors, quartz countertops are also available in different patterns which simulate the appearance of natural stones like marble and granite. Some quartz countertops also look like cement or concrete. Depending on how it was produced, quartz countertops can either have veins, flecks or a plain solid color. Finely ground quartz shows a smooth texture and look, while coarsely ground quartz has a flecked appearance. Choosing the pattern of your quartz will greatly depend on the aesthetic attribute you want to stand out in your kitchen. You can go with subtle veins and soft flecks if you want your quartz countertops to harmoniously blend into the color palette of your kitchen. But if you want it to stand and serve as a bold focal point for your kitchen, opt for quartz countertops with dramatic and exotic patterns. Also, choose a simple cabinetry design to go with to make sure that the two elements do not compete with each other. Prefabricated quartz countertops are ready made and precut countertops which have finished edges. These finished slabs are ready for installation, compared to custom countertops which still need to undergo manufacturing. Some people assume that prefabricated quartz slabs have low quality but this is not true. The same material that is used in custom cut projects is the same quartz that is used in prefabricated countertops. In the same way that prefabricated granite countertops are made of real granite and prefabricated marble countertops are made up of real marble. It does not affect the quality of the material at all. You get the same durable, hard surface, but only shorten the waiting period for production and custom fabrication. Custom fabricated countertops typically come with a lead time – meaning you need to wait for weeks to get your countertops because they still need to go through production, cutting according to specification, edging and finishing. Prefabricated quartz countertops can be installed easily. Most suppliers have it on stock and can be delivered in a short period of time once ordered. 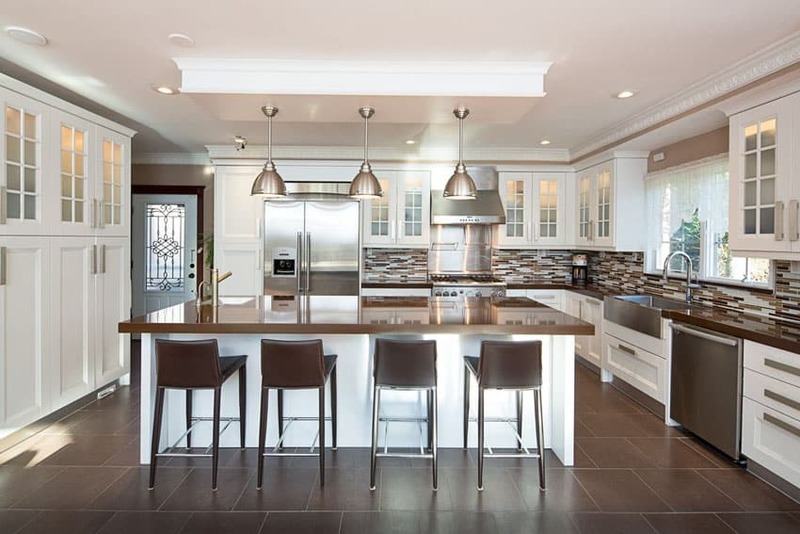 Quartz manufacturers typically offer prefabricated countertops which can be modified during installation. This means that the quartz slab comes in a standard size in a specific color and pattern and then cut according to the required size on the job site and fitted for installation. Unlike custom quartz countertops where the homeowner or clients have the choice to add and ending, finish before production, prefabricated quartz slabs are only available in specific colors or finish and usually come in limited edging designs. Typically, prefabricated quartz are available in different standard edging types which include the eased edge, bullnose edge, mitered edge and bullnose edge. When it comes to colors, prefab quartz offer a wide range of choices and designs. The most common sizes for prefabricated quartz countertops are 108 inches x 26 inches x 2 centimeters or 108 inches x 26 inches x 3 centimeters. Some suppliers offer it in 110 inches x 25.5 inches x ¾ inch thick for countertops, 110 inches x 36 inches x ¾ inch thick, or 110 inches x 42 inches x ¾ inch thick, or 110 inches x 52 inches x ¾ inch thick for islands and 110 inches x 4 inches x ¾ inch thick or 110 inches x 7 inches x ¾ inch thick for backsplashes. Some manufacturers offer prefabricated quartz countertops in two standard thicknesses: 2 centimeter thick countertops and 3 centimeter thick countertops. Prefabricated quartz countertops are the right fit for customers who have kitchen countertops that fall into standard sizes. It lessens the labor costs and reduces the installation time. 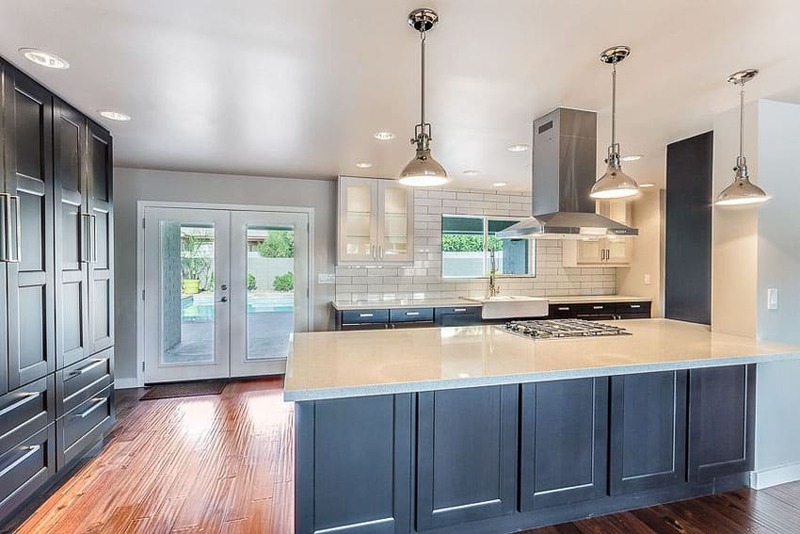 The average price of prefabricated quartz countertops including installation is $30 to $50 per square foot, depending on the size, color, design and brand of the material. 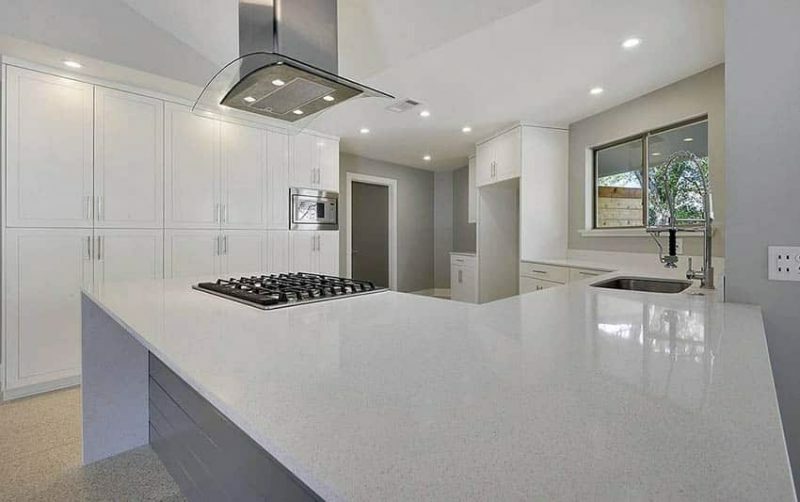 Quartz countertops are often called as engineered stone countertops, compound stone countertops or engineered quartz countertops because they are fabricated from a mixture of natural silicone dioxide a mixture of synthetic materials like resin binders and pigments. Quartz countertops are often confused with Quartzite, a type of natural stone material also used for countertops, that is why some manufacturers often refer to quartz as “engineered quartz” in order to avoid the confusion. 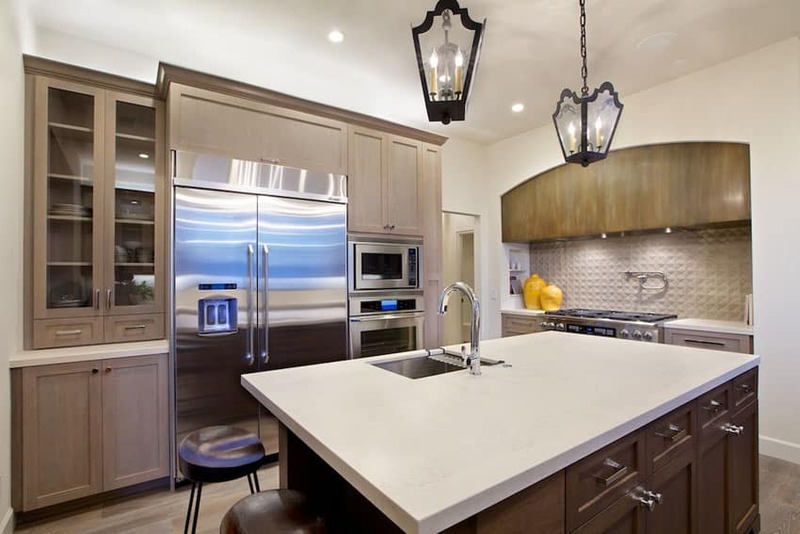 The main difference between engineered quartz countertops and quartzite countertops is that the latter is a form of metamorphic rock that is created when sandstone is subjected to extreme pressure and heat. Quartzite is also generally available in white to gray colors which have a tinge of pink and red which comes from iron oxides in the stone. Engineered quartz countertops, on the other hand, come in more diverse color options. Countertop edgings do more than just improving the aesthetics of kitchen counters. The shape of your countertop edges have functional benefits which can affect safety and maintenance. 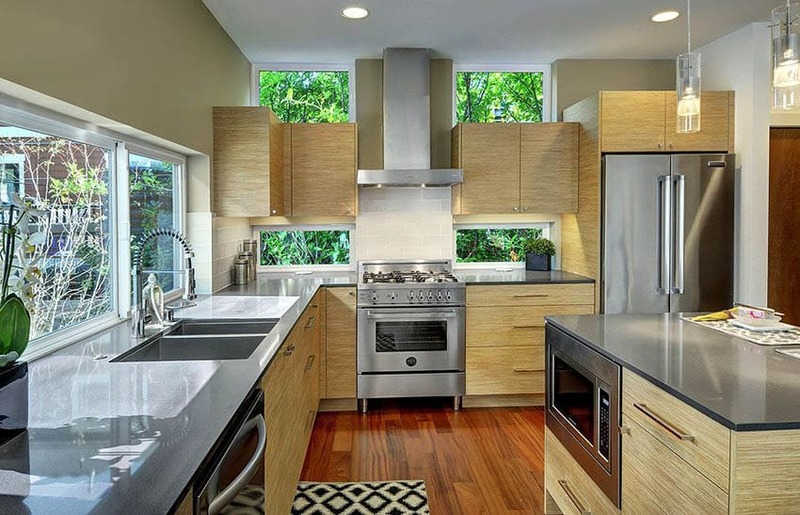 And since countertops are the most used parts of kitchen spaces, its shape and edges matter. Even the slightest detail in the kitchen counts to ensure work efficiency, to optimize functionality and to create a well balanced design aesthetic. The edging profile or edging treatment is the shape the kitchen countertop ends take. There are several edging profiles for countertops and this can be applied to natural stone and engineered stone surfaces and materials. Basic edge treatments can be done to 2 centimeter thick and 3 centimeter thick slabs. However for the more ornate designs, quartz countertop manufacturers would require a thicker slab or else the profile will not show. Edge upgrades cost more and add about $20 to $36 per linear foot to your material cost. This is mainly because they are more complicated to make and requires more time for polishing. Standard edgings such as the eased edge, bullnose edge and the bevel edge typically come with the installation cost. Aside from the basic countertop edges, some manufacturer offer their own signature patterns and specialty edge treatments to produce a more unique countertop design. These edge profiles are more intricate and ornate but can potentially add to the cost of your material. As mentioned, countertop edgings are essential in terms of safety. A completely square countertop or a countertop with sharp edges can be quite dangerous. It poses the potential risk of little children bumping their heads into the counter ends or user bumping their waist along the corners. Countertop fabricators will typically provide a small rounded edge or “kerf” to countertop edges to reduce this risk. Even if a homeowner prefers a truly square profile, manufacturers will still try to refined the corners a bit not only for safety concerns but to reduce chipping and breakage as well. Eased or straight edge – Also known as the flat edge and straight edge, an eased edge is the most basic type of edge that gives the countertop a smooth edge finish. The profile is square but has a very small eased top edge just enough to eliminate sharp corners. An eased edge shows the full thickness of the material. This is a standard edging that manufacturers give to quartz countertops and typically has no extra cost involved. This type of edge profile is the simplest but works well for any design design style, especially modern and contemporary settings which conform to a more angular and streamlined look. Beveled edge – The bevel edge is characterized by a 45 degree cut at the edge of the countertop material. The depth of the cut for bevel edge counters can be modified and adjusted based on the homeowners preference in order to highlight the pattern with dynamics or to expose the pattern of the stone more. This type of edge treatment has different variations depending on the sizes – it can be a half inch bevel , a ¾ inch beveled edge or a full inch bevel. The half inch beveled edge is a type of angular edging but offers a more subtle look. The ¾ inch beveled edge has a slightly deeper cut than the ½ inch bevel. Looking at ift from the sides, the ¾ inch bevel has a longer pitch or top half and a shorter rise or the lower half. The full inch bevel extends the pitch longer to create a one inch long 45 degree cut. This type of edge treatment combines both strong lines and graceful movement to produce an elegant countertop design. Double bevel edge – The double bevel edge is a variation of the bevel edge. Instead of having just one surface cut, both the top and the bottom part of the edges are treated with a small 45 degree angle cut. This gives the material an extra character compared to the double radius edge. Double radius edge – The double radius edge is almost similar to an eased cut edge, but has a more prominent curved profile on the edge. Looking at it sideways, this type of edge profile takes a rounded square form. This design is also simple, minimal and works best for most kitchen styles. Bullnose edge – The bullnose edge gives the countertop a rounded and completely smooth edges. This is one of the most popular edging profiles used and is considered a classic in the kitchen design scene. This is also another type of basic edging design and is considered an alternative for those who find flat or eased edges too straight, formal or stiff. Just like the eased edge, bullnose edges show the full thickness of the material. This type of countertop edge profile can be used for most kitchen design styles, whether traditional, transitional or contemporary. Half bullnose edge – Also known as the demi bullnose edge, the half bullnose edge shows a half round or half circle profile. The top part of the material is rounded and flattens at the bottom. This edging treatment highlights and shows off the stone more through a curved lines. You can use this type of edge treatment if you want to show off the thickness of your stone. 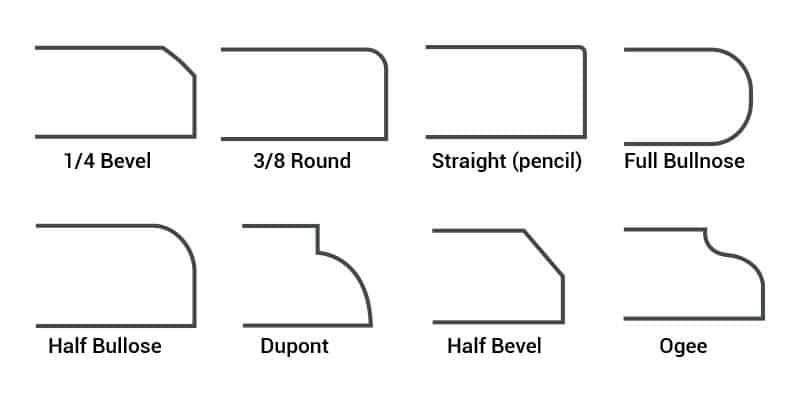 Bevel bullnose edge – The bevel bullnose edge is a combination of the beveled edge and the bullnose edge so its profile takes on a 45 degree cut smooth edge. The slight slope at the bottom part displays the cross section of the stone. This just adds a graceful element to the standard bevelled edge. The bevel bullnose edge can be used for both contemporary and classic inspired kitchen designs. Ogee edge – The ogee edge features a concave arch that transitions to a convex arch, so essentially it takes the shape of the letter “S”. This small “S” shaped is cut into the front of the stone, but the bottom part has a straight, flat edge. This type of edge profile is perfect if you want to add a classic flair and a more ornate decor to your countertops. The dramatic curves of the ogee edge is highly suited for paneled or plain cabinetry. Double ogee edge – A double ogee edge features the profile of a bullnose edge but above the curve part is a decorate inward dip. This is one of the most intricate types of countertop edge treatments and works well for classic and traditional inspired kitchens which have an extra luxurious, opulent and dramatic look. Ogee bullnose edge – The ogee bullnose edge combines the top half of an ogee which transitions into a bullnose. It is characterized by a more prominent “S” shaped profile but slightly elongate. Essentially, it is a more expanded version of the ogee edge. This is also highly decorative and ornate, perfect for classic inspired kitchen styles. Pair this type of edging with quartz countertops that have veining patterns or that look like marble to create a luxurious overall look for your kitchen. Stepped half bullnose edge – A stepped half bullnose edge features a slightly raised ledge that is placed above a regular bullnose profile. This type of edge profile adds more interest to your countertop design compared to the standard bullnose edge. It also shows the full thickness of your stone but adds a bit of character. Triple pencil edge – The triple pencil edge profile is one of the most decorative edging types. It features three levels of pencil shaped edges that cascade down the front edge of a countertop. You can use this edge profile if you want your quartz countertop to stand out in the space as it greatly draws attention towards the material. This can be paired with quartz that look like marble to add drama to the overall look of a kitchen. It is also highly suited for classic and traditional kitchen styles. The triple pencil edge may also cost you some extra because it is more complicated to make compared to other edge types. Countertop materials are typically available in two general sizes, 3 centimeters or 1 ¼ inch thick and 2 centimeters or ¾ inches. The standard thickness for quartz slabs is 1 ¼ inch but it comes in other thicknesses such as ½ inch, ¾ inch and 1 ½ inch. Cambria, one of the most popular brands of quartz, offers 1 centimeter thick slabs which are usually used for creating layered edging profiles. When it comes to countertop thickness, regardless of the material, the general rule of thumb observed is : 2 centimeters thick for bathroom counters while for kitchen countertops, the recommended slab thickness is 3 centimeters. However, this can vary depending on several factors like: the overall look you want to achieve for your kitchen, your budget, the application and installation. Ticker quartz slabs are more durable and easier to install compared to thinner quartz variants. Although higher in price, 3 centimeter thick quartz slabs provide a more effective long term value because it is stronger and less prone to breaking and has improved performance in heavy use areas. It is also easier to transport and handle. In addition to that, thicker quartz slabs that have few seams can increase the value of your countertops. Thicker and more quartz slabs also contribute interest when it comes to aesthetics. The thicker the countertop material is, the more noticeable it is in a space, the more prominent the colors and pattern are. 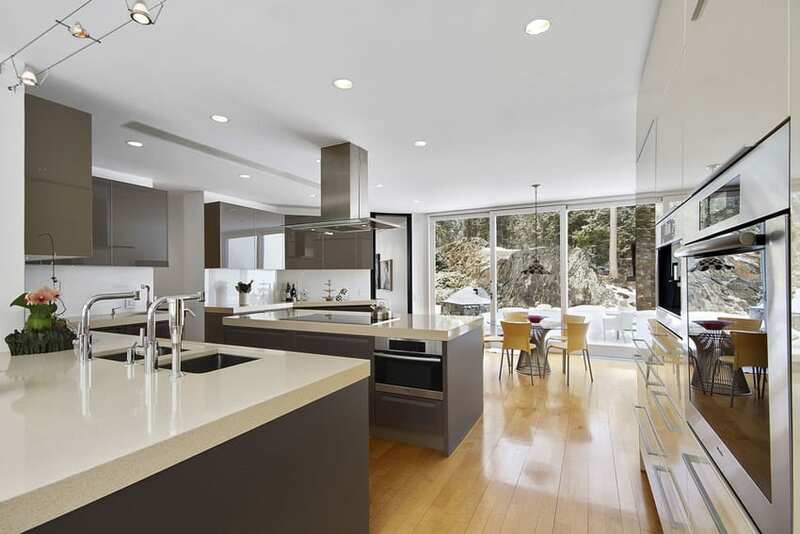 Thick quartz countertops can also serve as a stunning focal point for a space. Quartz slabs which are thinner or those that have a 2 centimeter or lower thickness typically require a plywood substrate for installation and added support such as wood to reinforce its strength. This is strongly recommended especially for countertop overhangs in kitchens and bars. Thinner quartz slabs have a more sleek and cleaner look. This is appropriate for modern and contemporary designs which have an ultra streamlined aesthetic. This type of quartz is also typically used for other applications such as backsplashes, wall coverings, shower areas, bathrooms, etc. Two centimeter thick quartz slabs often need an additional support but thinner variants often feature their own built in reinforcement. This helps prevent breakage and gives the quartz countertop extra strength. Countertop and surface materials typically come in different finishes. Each type of finish produces a different effect to the overall look of your kitchen while rendering their own positive and negative attributes. The strength of the material does not depend on its finish. Regardless f what you choose, the material remains to be strong and durable. Natural stones typically have more than two finishes such as honed, polished, brushed, leathered, flamed and tooled. But for quartz countertops, the two main finishes are polished and honed. Polishing is a type of process that subjects natural stone or engineered stone to a series of polishing wheels and pads which buff and grind the material to smoothen the surface. Polished quartz have a highly reflective surface and is characterized by their glossy and shiny appearance. The texture for polished quartz countertops is very smooth and makes a good working counter. Polishing, whether for quartz or for natural stone, is considered t be the finest finish available in the market. It is considered to be opulent, elegant and rich. 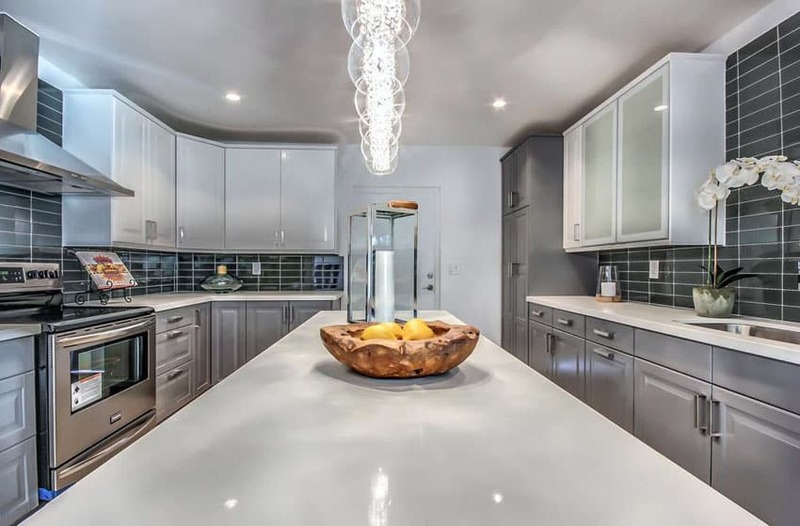 It’s mirror like shine renders a sophisticated and classy vibe to spaces which make it a popular choice for both traditional and modern kitchen settings.Polished quartz countertops also reflect light well and show off the beauty of quartz more. In addition to that, Polishing gives quartz a more vibrant and richer color. Polished quartz is easier to clean because of its smooth, flawless surface and in addition to that it also repels moisture well. Reflective surfaces also tend to show smudges and fingerprints less. Honing is a process which involves grinding the surface of a material into a smooth, consistent, flat surface. Before the material gets too shiny, the process is interrupted, leaving the material a soft, satin appearance. Honing also removes bumps and ridges in the material’s surface. Unlike polished quartz which have a shiny and glossy appearance, honed quartz have no shine and has a matte surface that leaves no reflection. The color of honed quartz is lighter than polished quartz. Honed quartz can either have low sheen or no sheen at all. The surface of honed quartz countertops is very smooth to the touch and is also very suitable for working counters. Honed quartz resemble the look of concrete, slate and limestone. The main advantage of honed quartz is that it captures the beauty of natural stone but offers a more durable and harder material. Some homeowners may find it lacking in shine, but honed quartz renders it own unique character to kitchen spaces. Honed quartz countertops offer a more natural and softer look compared to polished quartz. Honed quartz countertops also evoke a casual vibe and suits contemporary and modern designs well. 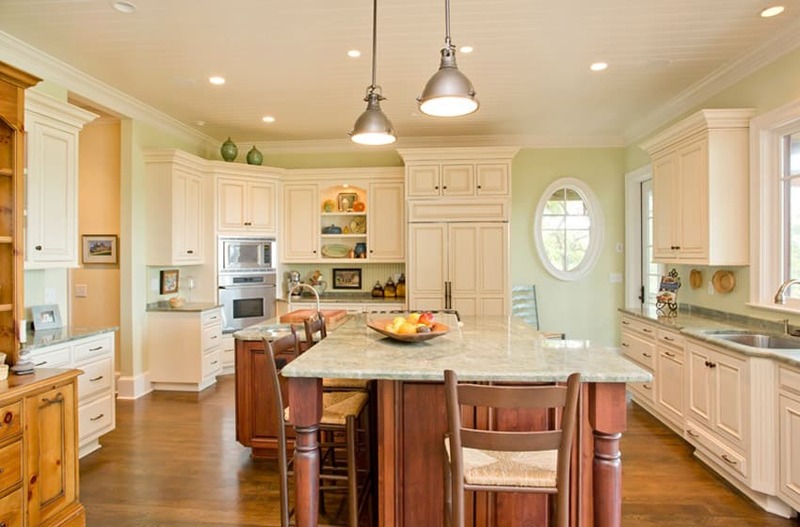 The relaxed feel that it renders to kitchen spaces make the ambiance more cozy and inviting. Under LED cabinet lighting, honed quartz countertops also look exquisite as the lighting is not so overwhelming and pronounced. Compared to polished quartz, honed quartz is ess common and homeowners love its subtle appearance. Honed quartz countertops are available in different colors, depending on the brand and manufacturer. Caesarstone, for example, offers three colors for their honed finish and each variant resembles natural stone materials. Misty Carrera is a type of hone quartz which simulate the appearance of natural marble. Desert Limestone, on the other hand, looks like limestone, while the last variant, Pebble, is characterized by a distinct gray color that resembles concrete. For the brand Silestone, they offer more than two finishes for quartz and the honed finish is often referred to as a suede finish. Honed quartz countertops require more maintenance compared to polish quartz countertops. Fingerprints, smudges, spots and grease are more noticeable on honed surfaces, thus occasional wiping is required. Seams and joints are also more visible, but this can be minimized by asking your quartz manufacturer to produce one full slab that fits your design requirements. Which one is better, polished quartz or honed quartz? A lot of you may be wondering, which type of finish is better when it comes to kitchen countertop use. Well, there is really no definite answer. Both finishes have their own advantages and disadvantages, while each one render a specific character to the overall look of your kitchen space. It really depends on your own personal preference in style and your kitchen’s existing conditions and your home’s overall decor. As mentioned earlier, the durability and hardness of quartz countertops is not affected by its finish. Whether polished or honed, you still get the same high performance that quartz countertops offer. You can weigh your options based on these guidelines and carefully choose which one is the best for your home. Quartz countertops perform well when it comes to kitchen use, but can they stand up to areas which are constantly exposed to higher levels of moisture and humidity? When deciding where to use quartz as a surface and finishing material, just keep in mind one fact – Quartz is only suited for indoor use. Which means, it is not recommendable for outdoor kitchen spaces but can be used for bathrooms. Quartz countertops are not only a practical and excellent choice for kitchens but for bathrooms as well. We all know now that quartz is a non porous material which means it is impervious to water. Bathrooms, being considered as a wet area in the home, need to have finishes that won’t get damaged from constant exposure to moisture, and quartz can live up to such circumstances. Bathroom quartz countertops are not susceptible to molds and mildew and is also sanitary to use. In addition to that, bathroom quartz countertops do not need to be resealed for protection. So you do not have to worry about upkeep and high maintenance procedures. Since bathrooms counters are also subjected to constant and heavy use, it is important that its finishing material is highly durable and can withstand daily wear and tear. Quartz countertops can do just that, as it is highly durable, resilient and long lasting. Aside from that, quartz can also be used for different applications in the bathroom, like a backsplash, accent or a tub finishing material. 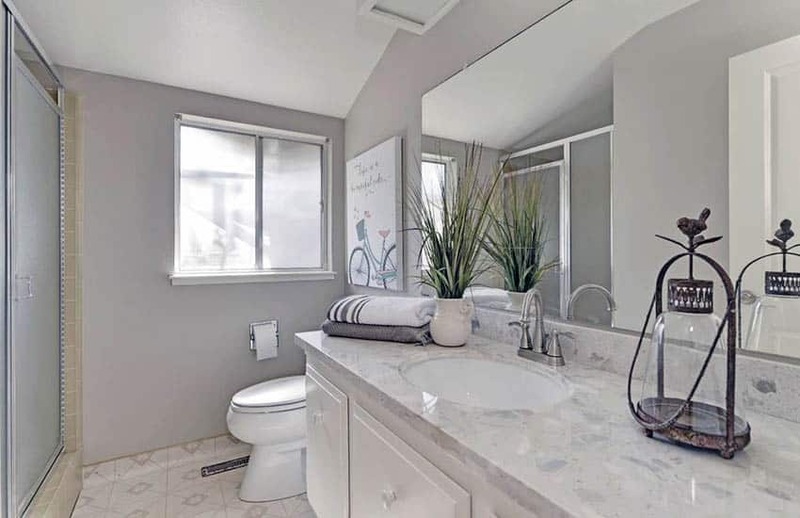 To top it all off, bathroom quartz countertops are also appealing and helps you create a visually pleasing bathroom design that is elegant, stylish and stunning. The wide variety of colors and patterns that quartz has will enable you to design the right bathroom countertop which will fit with the overall aesthetic of your bathroom. The most notable quality of quartz countertops with regards to their appearance is their close resemblance to natural stone materials like marble and granite. Quartz countertops capture the distinct elegance and beauty of natural stone without the need for high maintenance. 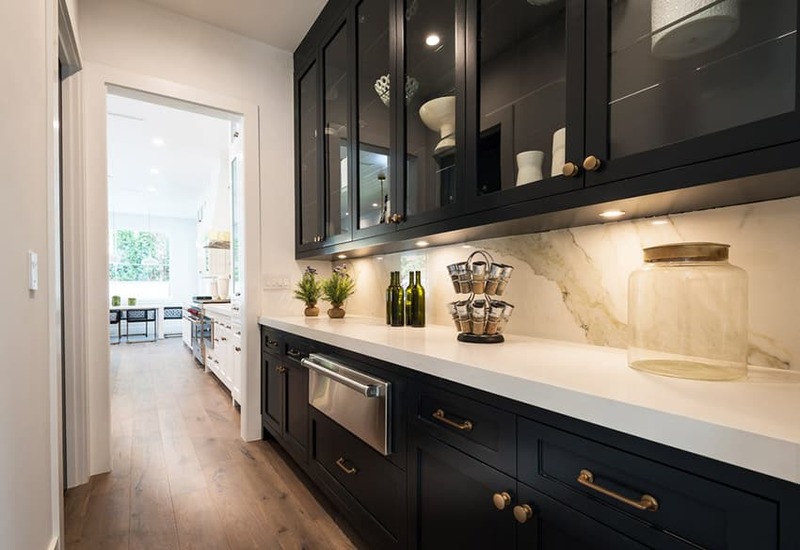 The advantage of using marble like quartz countertops is that it allows you to bring in a luxurious feel to your kitchen, without sacrificing quality and durability, making it a very practical choice for homeowners. Although some homeowners still prefer real marble, quartz countertops are a good alternative because it is non porous and won’t stain. One big difference that the two materials have is that real marble is cool to the touch, and of course, engineered stone isn’t. But quartz countertops make up for this lack by providing a harder and more durable surface. White marble is a classic choice for traditional luxurious kitchens. And since it is widely in demand, all quartz countertops manufacturers offer this design. Most white quartz countertops look like marble. Different brands offer quartz countertops that have a bright white or creamy beige base color which is accentuated with dramatic gray veining patterns. Some feature soft cool gray veins, while others showcase heavy thick veins which make the countertop more prominent in a kitchen space. Most of these white marble like quartz countertops look like carrara marble. Aside from white, marble like quartz countertops are also offered in different colors like brown, black and other earth tones. When used for kitchens, quartz countertops that look like marble bring elegance, sophistication and a luxurious feel. When looking for quartz countertops, you’ll come across several brands of the material. Some of them are more popular than others, and each specific brand offer their own distinct line of quartz countertop colors and patterns to offer to clients. Regardless of the brand, all quartz countertops follow the same original process that the Breton company started over 50 years ago. Since Bretonstone technology holds the patent to the machines, they have granted 52 brands the license to manufacture quartz countertops according to their standards. The quality of the material is the same for all quartz countertop brands. All quartz countertops have that distinct material composition, hardness, durability, low porosity and resistance to stains, scratch and heat. The only difference that each brand of quartz countertop has is the size of the slab, warranty, price, edging treatment, color names and designs. As mentioned, each brand of quartz countertop produce their own range of designs which include the visual appearance of the material. Colors and pattern like striations, veins, flecks, streaks differ in each brand as they can freely customize how each type of quartz looks like. Each quartz color also has a specific name, depending on what the manufacturer gives it. A pure white quartz for example is known as Pure White for Caesarstone, but Yukon Blanco for Silestone, although both have the same appearance. Edge profiles also differ for each brand since this is usually done at the factory rather than added by the fabricator. Some quartz countertop brands only offer three standard edging designs, while other have more intricate and diverse edging treatments. The slab size also differs for each brand. Some manufacturers also offer prefabricated quartz countertops which come in precut standard sizes. With all the difference in designs and sizes, the prices for each brand of quartz countertops also vary. This can be advantageous when looking for the right quartz countertop for your home because it gives you a basis for comparison and more options to choose from with regards to the cost. In addition to that, quartz countertops also come with a warranty from the supplier and each brand offer different lengths, terms and limitations for each material purchased. Caesarstone – Caesarstone is a quartz surface manufacturer from Israel. It was originally manufactured to replace the terrazzo tile industry which was popular before in this country. Caesarstone has 53 colors, 8 edge type and three textures namely smooth, matte and satin. It offers two type of slab thicknesses and has a 56.6 inch by 120 inch standard slab size. All Caesarstone quartz come with a lifetime warranty. Caesarstone is known for producing quartz which have a natural stone like appearance. The edge of Caesarstone among other quartz brands is that it offers a premium line of quartz that incorporates semi precious tones in its surface to produce exotic looking designs. This is known as the “Concetto Collection” which is composed of ten one of a kind designs that have petrified wood, agate, dumortierite and tiger’s eye. Another notable series is the Motivo Collection which offers rich textures and embossed patterns like lace or crocodile skin. This finishes are perfect if you want to make your kitchen the main attraction of your home. Silestone – Silestone is a quartz brand of the Italian company Cosentino which is based in Almeria, Spain. Overall, Silestone has the most number of colors among the three brands, 142 designs to choose from, to be exact. It offers 15 types of edging and is available in in smooth, suede and volcano finish. The suede finish is characterized by small pores while the volcano finish is characterized by big pores. When it comes to sizing, Silestone quartz comes in a standard slab size of 55 inches by 120 inches, while the humbo slab is 63 inches by 128 inches. It has three different types of thicknesses, namely 1.2 centimeters, 2 centimeters and 3 centimeters. Unlike the two other popular brands, Silestone has a limited warranty of 25 years. What sets Silestone apart from other brands is that it offers bold and vibrant solid colors such as reds, greens, oranges and blues which are perfect for modern kitchen settings. Silestone offers mixing and matching of colors, style and finish of their products to produce a full personalized material to fit one’s taste in style and existing home decor. Cambria – Cambria is a US based company that started producing quartz surfaces in the year 2000. The biggest selling point of Cambria quartz countertops is that it offers the widest range of colors, designs, edge treatments and slab sizes. Cambria has 133 colors and design, 19 edge profiles available and comes in fine, mixed and heavy finishes. In addition to that, Cambria has the most natural looking patterns. Aside from that, it also allows the material to be tailored according to one’s personal taste, giving homeowners more room for experimentation when it comes to design. The standard slab sizes for Cambria quartz countertops is 55.5 inches by 122 inches, while the jumbo slabs are 65.5 inches by 132 inches. The thickness for the quartz slabs range from 1 centimeters, 2 centimeters and 3 centimeters. It also comes with a lifetime warranty, however Cambria quartz is not available in local home improvement stores and can only be purchased from authorized architects, builders and designers. Zodiaq – Zodiaq is a quartz made by DuPont, the company that invented the solid surface Corian. Zodiac quartz countertops come in 54 different designs and colors and come in a standard size of 63 inches x 120 inches, with thicknesses of 2 centimeters and 3 centimeters. LG Viatera – LG Viatera is produced by the popular South Korean company LG which makes appliances, electronics, chemicals and equipment. LG Viatera has 64 different designs and colors. Pental – Pental is another US based distributor. It is a private label quartz line in Seattle which produces cheapers quartz surfaces that are at par with the high quality of other brands. It has three collections namely: inspire collection, natural collection and classic collection. Daltile One Quartz – Daltile is a company which produces ceramic, porcelain and glass tiles. Daltile offers 38 different colors and design at a lower price. Should you DIY or hire a professional for installing quartz countertops? Unlike tile countertops, installation for quartz countertops is best left to the professionals because of the labor intensive process it entails. Hiring a professional installer to do the job for your ensures a high quality of work and a longer lasting countertop. Although not as delicate and fragile as natural stone, quartz can be quite difficult to handle because of their weight. Quartz slabs are very heavy and an extra helping hand is needed during installation. If not properly handled, quartz can crack. Look for certified installers to make sure that your quartz countertops are installed perfectly. Quartz can be cut into different sizes, but it cannot be put back together again. So make sure that everything is properly measured before installation.Ideally, the countertop must be precisely measured and cut into a precise size and shape. If ever some adjustments need to be done, the use of a wet saw is required. Quartz countertops may still count as reasonable “do it yourself” projects provided that the homeowner is skilled enough and armed with the right tools and equipments. The quartz slab must be precisely prefabricated in the right shape and size before installation. Most homeowners do not have the right tools to cut and polish quartz so buying pre fabricated slabs is the best bet for DIYers. There are most important factor to consider when installing quartz countertops is the base cabinets below it. Since quartz countertops are extremely heavy, the base cabinets for your kitchen must be strong enough and ready to bear the weight. That is why most suppliers recommend a sturdy solid base like woof or reinforcement to be able to support quartz countertops. • Prepare the area. If you kitchen cabinets are newly installed, wait for the paint to completely dry first before installing your quartz countertops. Prepare everything you need before hand and make sure that all materials and tools are at hand to save on time, effort and money. Analyze the existing site conditions in your kitchen and strategically plan demolition works (if there is any), mobilization and material deliveries. In addition to that, shut off the water supply if you will be installing a new sink and faucet. • Measure the area. Using a tape measure, carefully measure the space to determine the exact size of quartz countertop that needs to be installed. You can draw a simple diagram of your kitchen counter layout then indicate the taken measurements in the drawing. Make sure that the measurement is accurate, while taking into consideration the size of the backsplash and the space needed for it during installation. In addition to that, note down the sink size and the hole needed for its installation. Once the measurements are complete, you can either buy a pre fabricated slab with the perfect size or buy a slab which is bigger and then cut it down to the required shape and size. It is more recommended to buy a prefabricated slab since it lessens the work and ensures a more perfectly fitting quartz countertop. Quartz can be cut into sections to make installation easier, but keep in mind that the least number of seams should be used. For L shaped kitchens, quartz can be cut into two pieces at a 90 degree angle. You may ask your supplier to get the best recommendation for the material and also, you can request the manufacturer to cut the quartz sink hole before delivery. • Cut the countertop. This step is optional, because as mentioned above, you can either buy a prefabricated slab to eliminate cutting. However if you decide to go the other way, mark the material using painter’s tape on areas where it needs to be cut. Before cutting your material, put on safety gloves and goggles to protect yourself from any dust or debris. Attach the diamond blade to the saw. On one end of the material, spray some water to the material using a spray bottle to get it damp. Keeping the quartz wet during cutting is a critical step because it prevents the dust from accumulating and covering the mark you made while keeping the heat from burning the material. Run the saw into the quartz as you follow the mark. Push down as you go forward and carefully do this without hurrying. Taking your time will ensure a straighter and more accurate cut. Once finished, double check the materials and measure all sides to make sure that the size is correct and accurate. In addition to that, make the necessary cut outs for the sink or any built in appliances like a hob or cooktop. • Dry lay your material. Dry laying will help you determine if your quartz countertop fits the base cabinets well or i adjustments still have to made. Aside from that, it also gives you a general idea on how your kitchen countertop will look like. Simply place the quartz pieces above the countertop and check the alignments and do the necessary adjustments. After dry laying, remove the quartz pieces and set aside. • Protect the edges of kitchen cabinets. Use painter’s tape to cover the edges of the kitchen cabinets to prevent damage. This step needs to be done before the application of adhesive so as to prevent it from slipping in the cabinet faces. • Install the countertop. Apply construction adhesive to the top and edges of the base cabinets and then carefully place the quartz countertop on top. Leave enough room for the backsplash material. Put firm pressure over the quartz countertop to make sure that it adheres completely to the base cabinets, then use a level to make sure that the countertop is placed properly. Always double check if your material is properly aligned with the base cabinets. • Using clear silicone (or any silicone sealant which matches the color of your quartz countertops), seal the joints by running the silicone gun carefully along the seams and edges of the countertop. Wipe off any excess and allow to dry. You can also line the edges with painter’s tape to protect the surface of your quartz countertop and to make cleanup easier. Allow the countertop to dry for 24 to 36 hours. • Install the kitchen sink. Carefully place the sink above the countertop (this is for overmount sinks). If using an undermount sink, you may want to reverse the steps and install the sink first before installing the kitchen counters. Once the sink is properly fitted, run caulking around the edges of the sink. Connect the drain and install the faucet and other fittings. Once finished, you can now turn on your water supply and your quartz countertop is now ready for use. Maintaining quartz countertops is easy. The resin binders that make up quartz gives it a stain resistant, non porous and durable surface. An since it does not get damaged easily, quartz countertops are guaranteed to last for years while maintaining its pleasing appearance. Maintaining quartz countertops involves daily cleaning and deep cleaning. Daily cleaning is the basic routine that you do on a day to day basis to keep your quartz countertops sanitary and free from dirt and spills. Deep cleaning refers to periodic maintenance which is done at regular intervals, like once a month, to keep the surface’s natural sheen and glossy appearance. As mentioned before, the heat resisting abilities of quartz countertops are limited. Despite its durability, it is always beneficial to take several precautionary measures to prolong the lifespan of your countertop. Never place hot pots, pans and skillets directly above the countertops. Use hot pads, trivets or a small plate for holding hot kitchen utensils to protect your quartz countertops. Also place sufficient protection for heated appliances. The same thing goes for scratches. Although quartz is generally scratch resistant, it is also beneficial to take precautionary measures when using knives and other sharp utensils in the kitchen. Using quartz countertops as a work counter and as a cutting board may not be harmful to the surface itself, but it may cause your cutting utensils and blades to dull over time. It is better to use cutting boards during food preparation to protect both your countertop and kitchen tools. In general, always remember that “preventive maintenance is key”. Giving immediate attention to spills and daily wiping are the basic maintenance requirements of quartz countertops. The best quartz countertop cleaner for basic and routine daily cleaning is a mild soap and warm water solution. Other alternatives for daily cleaning solution is a mixture of household vinegar and water. Mix 25 percent of vinegar with 75 percent of water in a spray bottle. Simply wipe the quartz countertop with the solution using a soft damp cloth, then rinse with warm water. Periodic maintenance for quartz countertops include deep cleaning. This must be done at regular intervals to ensure the quality, appearance and lifespan of your quartz countertops. Spraying a generous amount of non abrasive surface cleaner or a non abrasive detergent soap and letting it sit for 10 mins in the countertop will help you do the trick. Once finished, make sure to wipe any residue with a soft sponge. Kitchen countertops always come in contact with raw meat, poultry, seafood and fish. To make sure that they do not harbor any harmful bacteria, make sure to disinfect them on a daily basis. Use paper towels to wipe up any residue, moisture and debris. Spray the countertop with a multi surface antibacterial spray cleaner and allow to sit for a few minutes. Wipe the countertop using a clean paper towel, making sure that no residue is left. Alternatively bleach free disinfectant wipes can also be used as a quicker fix. Although quartz will resist stains, it is important to wipe up spills or clean up messes immediately before they start to dry. Liquid spills. Liquids such as wine, tea, vinegar, soda, lemon juice, coffee are not harmful to quartz countertops. But strong dyes, solvents and chemicals can possibly cause permanent discoloration on quartz countertop surfaces. To prevent any permanent damage, immediately wipe any spilled liquid as soon as possible with a clean, damp cloth. Tough stains. Heavy and persistent stains can be addressed through the use of adhesive removers which can be scrubbed to the surface of the countertop and rinsed with water. Dried spills can be cleaned with the use of a quality glass or surface cleaner and a non abrasive sponge. Citrus cleaners like “Goo Goo Gone” can also remove tough stains. Just spray it onto the affected part of the quartz countertop, let sit for 10 minutes, wipe with a clean cloth then rinse with warm water. Alternatively, isopropyl rubbing alcohol or denatured alcohol can also be used for cleaning tough stains. Pour some isopropyl alcohol to a piece of wet rag then rub it onto the stain. Rinse the counter thoroughly with warm water. Grease and oils. Cooking grease and oils on quartz countertop surfaces may be removed using a degreasing product. Most degreasing products come with specific instructions from the manufacturer, just make sure that you follow them. Alternatively, disinfectant wipes can also be used, but just make sure that they are bleach free and rinsed immediately afterwards. Permanent marker stains. Permanent marker stains are a common problem for households with little children. Ink and permanent marker stains can be cleaned using a piece of moist cloth and a commercial degreaser or cleanser, such as “Goo Goo Gone”. Rub the stain with the cloth and product then rinse thoroughly with warm water. However, if you want be extra protective of your quartz countertops, you can use placemats or kraft paper to prevent your kids from writing directly on the surface. Other products and build ups. Gum, food, paint and other types of products can be removed by scraping gently using a plastic putty knife. Again, this must be done before they dry and harden up. Avoid using scouring pads to heavily scrub quartz countertops as it can dull the surface of quartz countertops. Avoid cleaning agents and products which contain topical liquids, oil based soaps and tarnish as it can decrease the natural glossiness and surface sheen of quartz countertops. Harsh chemicals and products like turpentine, nail polish remover, drain cleaner and dishwasher rinsing agents are also not advisable because it could break down and disintegrate the bonds between the resins and the quartz. High ph substances such as concentrated bleach or oven cleaners are extremely harmful to quartz countertops. Highly acidic and highly alkaline substances must also be completely avoided, however, milder alkaline solutions like diluted bleach are occasionally tolerable. Ammonia based cleaners are also harmful because it can cause the color of highly pigmented quartz countertops to fade over time. Oil based soaps are also considered a no-no since any residue left behind the countertops surface causes the quartz to dull and reduce its natural shine. In the event of exposure to one of these substances, immediately and thoroughly rinse the affected part of your quartz countertop with water. Make sure that the cleaner and product you use is compatible with the type and brand of your quartz countertop. You can always ask the manufacturer regarding maintenance guidelines to preserve the quality of your quartz countertops. Clean the quartz countertop. Using any of the quartz countertop cleaners mentioned above, such as the “mild detergent soap and water solution” or the “vinegar and water solution”, gently wipe and scrub down your quartz countertop. Although scratch resistant, it is better not to use an abrasive pad as it can leave streaks in the polish or residues in the surface of the countertop. If the stain is persistent, leave the cleaning solution to sit for several minutes to allow the tough stains to break down. With quartz countertops, there is no need to worry about scratching the surface while wiping as it is not a delicate and sensitive material. Just make sure that the countertop is thoroughly clean before doing anything else. Rinse the quartz countertop thoroughly. Streaking in quartz countertops is usually caused by soap and food residue that is left on the surface. Ansd since quartz countertops are nonporous,any liquid or food spilled does not penetrate into the material but instead leaves a film on the surface. To ensure that no cleaning solution and residue is left behind the quartz countertop, it has to be thoroughly rinsed with water. Using a spray bottle, liberally apply water to the countertop and allow it to soak. Then, use a sponge to gently scrub the quartz countertop. Wipe off the water with clean, dry cloth, making sure that no streaks are formed. Alternatively, a squeegee can be used to achieve a streak free shine. You can double check your quartz countertops surface for streaks once it gets completely dry. Spray the quartz countertop with window cleaner. You are probably wondering why use a window cleaner in cleaning countertops. Well for starters, window cleaners are multi purpose cleaning agents and do a highly satisfying job when it comes to grease cutting. As we all know, kitchen countertops are filled with grease as they get constantly used for cooking and food prep on a day to day basis. Grease can build up and eventually form an invisible film. This cooking film can be removed through the use of a trusted window cleaner. Spray a minimal amount of window cleaner over the countertop surface. Make sure not to over spray and apply on what is needed to make sure that any excess is removed easily. Wipe the whole countertop surface with a soft cloth and do this is a left to right direction, then go over the top to bottom. After this, use a piece of paper towel to make sure that no cloth fibers or lint is left behind. Window cleaners leave a shiny and streak free quartz countertop. It dries quickly too and requires minimal effort to apply. Alternatively, natural and organic window cleaners which are chemical free can be used as they function the same way, but has no risk of chemical contamination. Is it okay to use or add more polish or use sealer for quartz countertops? While some natural stone countertops need sealers for extra protection against moisture and bacteria build up, quartz countertops do not need sealing or resealing at all. Quartz countertops are also polished by manufacturing companies before installation. They usually use a sealing surface polish to keep it shiny and lustrous. Adding more polish will do your quartz countertop no good as it will ironically create a more dull finish due to potential product build up. Engineered stone has to be mechanically polished and using any unapproved product to improve its shine will only damage your quartz countertop.